Notarize legal, financial real estate, personal documents. 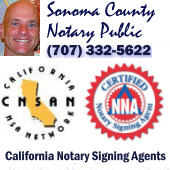 Cotati, Sonoma County traveling notary. areas: Petaluma, Cotati, Penngrove, Rohnert park, Sonoma, novato, Santa Rosa, Windsor, Marin County, Napa county. APOSTILLE REQUEST Full Name Tel # Documents description When you need the Apostille done? Any other comment.